Summer weather leads to summer fragrance, of course, and right now, our favourite brands will already have their seasonal editions on the market. One fragrance house that unexpectedly has a summer scent is Amouage. Not one to follow trends, Amouage offers luxurious fragrances crafted by some of the best noses in the business, and their style courts an international array of influences. Whether they are taking inspiration from the calm in the chaos of modern life, resulting in the vanilla bonfire of Interlude Man, or if they are absorbing the ancient history of the Silk Road in Epic Woman, their fragrances always surprise, beguile and transport the wearer. This one is no different. Amouage’s summer scent is called ‘Amouage Sunshine Woman’ (hereafter referred to as ‘Sunshine’) and it is described as being for “a woman that soars in the summer”. If that sounds like you, or if you are a gent that also flies in the heat (we ignore gender rules here), then do read on. Sunshine is an intriguing mix of almonds, fruit and white flowers that doesn’t feel the need to shout or demand too much attention. This is a fragrance that is content to be subtly radiant on the skin. It may not get you noticed on the beach, but you won’t mind because you’ll be nose deep in the fragrance, ignoring everybody else. Sunshine is not the summer fragrance one expects. Where so many stick to the familiarity of zesty citrus or aquatic colognes, Sunshine is not one of these fragrances, in fact, it’s as far removed from the often wishy-washy style of summer scents that it feels like something else entirely. Perhaps more interesting though, is the fact that Sunshine feels very out of the ordinary for Amouage, and where the brand is used to opulent and symphonic creations, this one feels a little bit more paired back, and a lot softer. Sunshine is Amouage at its most cuddly, intimate and dare I say, cute. Opening with an almost delectable array of gourmand notes, Sunshine starts as an ode to marzipan. It has a warm, cherry-like vibe that is surprisingly devoid of much sweetness, bringing to mind the idea of silver trays filled with loukhoum. But this delight is a measured one, and never once does it feel sickly, sticky or indigestible, and the whole thing is very subtle right from the word go. As Sunshine settles on the skin, the sour and hissy tones of blackcurrant come through. This goes a little way to making the composition much richer and liqueur-like. The apricot jam tones of osmanthus really sing at this point too, melting into the hot creaminess of jasmine, and magnolia petals to create a floral compote that is delicious, comforting and warm. If Sunshine is anything, it’s smooth. So when does the idea of actual sunshine come through? Well, to my nose, this all happens in the base, which is woody, warm and full of creamy vanilla. Sunshine is not a solar floral in the same way that say, Thierry Mugler’s Alien is, for example. Instead it evokes the idea of sun kissed skin. Imagine that you’ve spent a long, relaxing day at the beach or out in the countryside, and your skin has soaked up all of the sun’s warmth, combining with the intimate smell of the body and some handy sun cream – et voila, you have Sunshine. I enjoy Sunshine, mostly because it isn’t what I expected from Amouage at all. It shows the diversity of a brand that really knows how to play with the unusual and the classic, to create something new. Yes, it’s on the pricey side (let’s not hide it), but if it’s within your budget then Sunshine is a worthy contender for a subversive summer scent. I reckon that it would also make a wonderful comfort scent in the deepest parts of winter – those times when the body and mind both crave a bit of sunlight. 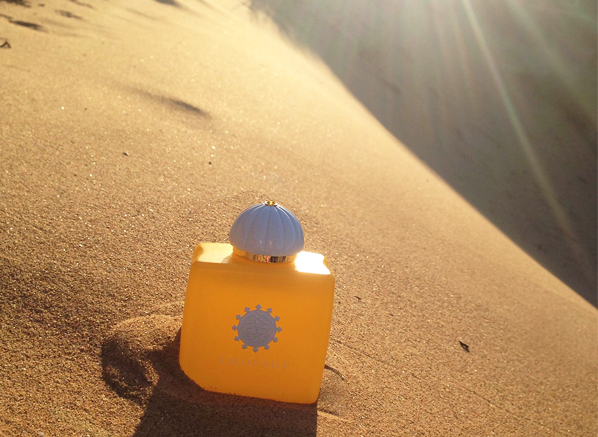 So, if you want to be the most fabulous-smelling sunbather on the beach, Sunshine is what you need. After all, what’s a summer without Sunshine? This entry was posted on Wednesday, July 15th, 2015 at 10:14 am and is filed under Candy Perfume Boy, Fragrance. You can follow any responses to this entry through the RSS 2.0 feed. You can skip to the end and leave a response. Pinging is currently not allowed.